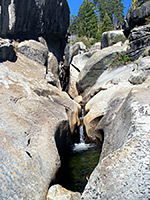 The southernmost approach to Yosemite National Park is from Fresno along CA 41, a busy, single carriageway road that crosses farmland of the central valley, enters the Sierra Nevada foothills and climbs gently through oak/pine woods to Oakhurst, the last significant town before the park boundary, and which has a small selection of hotels. From here, CA 41 ascends more steeply through the Sierra National Forest for 15 miles to the entrance station then forks; left is the route taken by most visitors, eager to see Yosemite Valley, but right is a short side road to the largest group of sequoia in the park, the Mariposa Grove of Giant Trees. Just south of the park boundary, several tracks into the national forest allow for free overnight camping though there is an official NPS campsite (at Wawona) a few miles north. Wawona also has a gas station, hotel and several shops, but no particular scenery of note; for 20 miles the road passes wooded hills and ravines, nearing the familiar granite landscape of Yosemite only as it approaches the main valley. 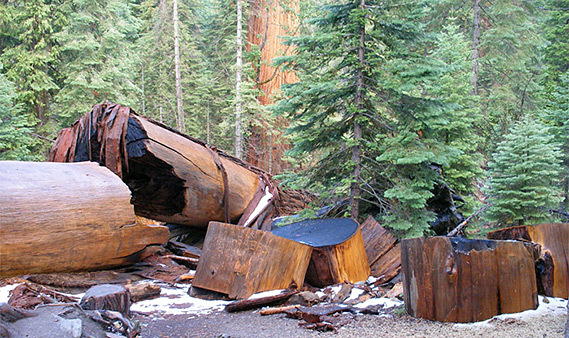 In July 2015 the Mariposa Grove was closed to the public at the start of a major restoration and reconfiguration project, which will replace most of the roads with trails, add several new paths, and remove commercial activities (gift shop and tram tours) from the area. All visitors will now walk to the grove, starting from a new carpark near the South Entrance. The project is expected to be complete in spring 2018. The following description relates to the grove before the closure. The 2 mile road to the Mariposa Grove crosses a wooded hillside with occasional good views south, then narrows as it enters a cool, sheltered basin where the sequoia trees are first encountered. All private vehicles must stop at a smallish parking area (RVs not recommended after 9 am) at the edge of the trees although the paved road continues another 3 miles to 6,810 foot Wawona Point. The carpark has information boards, trail brochures (50 ¢), gift shop, rest room and a tram terminus, from where tractors with open air coaches take visitors up the road, stopping several times at viewpoints and named trees. Trams cost around $16 per person and run every hour, taking 75 minutes for the full loop. 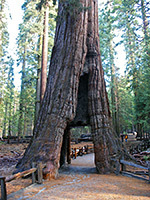 In spring and summer, the grove is linked to Wawona by a free shuttlebus, sometimes the only access to the trees as the road is closed if the carpark becomes full. In winter the road is shut entirely but the trees can still be reached on foot. Sequoia are dotted around the parking area and extend along the road for a mile or so at either side. They are tall and grand but do not grow quite as large or as densely as the more famous groves in Kings Canyon and Sequoia national parks. At Mariposa the biggest trees are quite well separated from each other across an open, airy hillside, surrounded by healthy young sequoia and regular ponderosa pine, with plenty of fallen trees of varying ages, some sectioned into huge logs. Most famous of the downed giants is the Fallen Monarch, right by the carpark, which became well known after publication of a photograph in 1899 showing a long line of horses from the US Cavalry standing on top of the trunk, something the NPS would no longer allow. The live trees are divided into lower and upper groves, separated by half a mile of normal pines, both ringed by the 7 mile Outer Loop Trail and crossed by various shorter paths. There is no main paved trail so to see a good selection of trees requires a walk of 1 - 2 miles along sometimes moderately steep footpaths. Two famous trees in the lower grove are the 2,700 year old Grizzly Giant, the largest sequoia at Mariposa, and the California Tunnel Tree. This is one of two that were hollowed to allow for coaches to be driven through but the road has long since been rerouted to one side. The 227 foot tall Wawona Tunnel Tree in the upper grove had a larger cavity and could be driven through by all visitors until it fell in the snowy winter of 1969. Other notable sequoia in the upper grove are the Clothespin Tree and the Telescope Tree, both damaged by fires but still alive and growing. At the end of the road, a short path leads to the top of Wawona Point, for good views northwards. 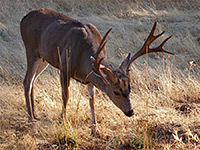 At Wawona, 5.5 miles from the southern park entrance, the forest opens out to the grasslands of Wawona Meadow, along a tributary of the South Fork of the Merced River. 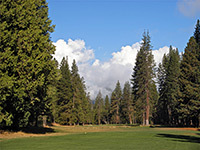 In 1918 the northern third was made into a nine hole golf course (par 35) for guests at nearby Wawona Hotel but the rest remains untouched, and is circled by a level, 3.5 mile trail. Next to the hotel is a gas station, post office, shop and a side road to the cabins of south Wawona. A little further is another side road, to the main village of North Wawona, including a ranger station, private campground, the Pioneer Yosemite History Center, dozens of houses and a trailhead for the route to 240 foot Chilnualna Falls. The NPS Wawona campsite is a mile north along CA 41, on the west side of the highway next to the river. Like all the main campgrounds in Yosemite, advance reservations are always required and the campsite is usually full even early and late in the year. The road northwards passes a few trailheads before nearing Yosemite Valley at Chinquapin Junction, where a left turn leads to Glacier Point.